Stoked for the upcoming season! If you want to come surfing in Nicaragua and catch great waves, now is the time to check out your favourite flight search engine! The waves will soon be climbing up! Read on for the best time to surf in Nicaragua! January and February in Nicaragua is well known for hosting a lot of beginner surfers. We had some little surfers here at Giant’s Foot Surf this January, and it was a ton of fun! Looking forward to teaching and creating more surfers in February. We have a special promotion on right now for beginners in February so get in touch! For beginners February is the best time to surf in Nicaragua! Best time to surf in Nicaragua? If you are looking for consistent waist to head high swell, Nicaragua is best for surfing between March and September. Southern swell arrives at the end of March and builds over the next few months. In April, the swell is good and crowds are minimal. The only exception is Semana Santa (Holy Week), the week proceeding Easter. This year, Semana Santa takes place from April 14th to the 20th. If you are here at that time, be prepared for Nicaraguans descending on every beach in the country. The population of Managua, 1.4 million people, head towards the beaches Thursday through Sunday before Easter. During this time our quaint Town of Playa Gigante will transform from a sleepy fishing pueblo of 500 to a crazy beach party with 6-10 thousand people. It can be a great time and unforgettable experience, but it is an important thing to be aware of when booking your surf vacation in Nicaragua. With May comes the rains. Temperatures cool off a bit and the swell continues to build better consistency. May through August is prime-time for southern Nicaragua. Hands down the best time to surf in Nicaragua. 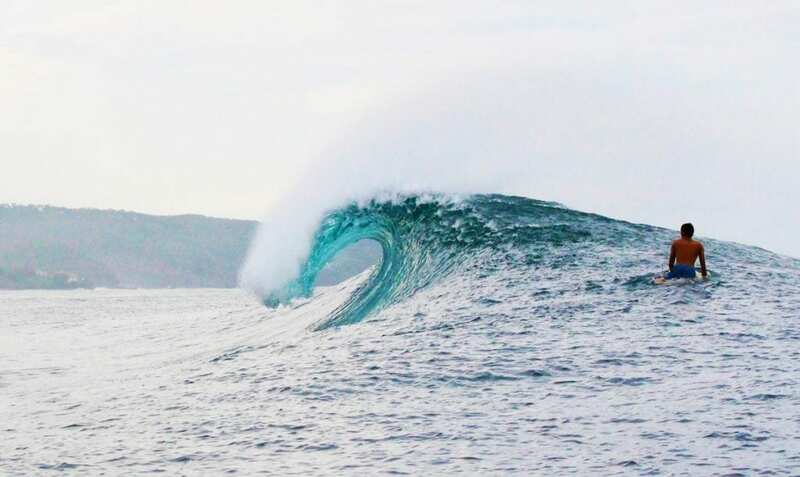 The swell is dependable and big days can generally be expected. What makes this time of year best for Southern Nicaragua is the wind created by the lake effect. All sorts of weather conditions go into making each break work at its best; swell height, swell direction, tidal conditions, and steady offshore winds. Most spots have wind conditions that tend to be predictable, but they will shift directions at different times of day. Down here in the Rivas province, Lake Nicaragua creates steady daylong offshore winds. That’s not to say that onshore never happens, but Playa Gigante isn’t like some places where the wind always turns onshore after noon. September and October are the peak of the rainy season. In October, the wet season tropical storms start to hit Gigante. Occasionally these storms will arrive in September but it is uncommon and the swell is still good. The best waves in Nicaragua depend on what kind of waves you are looking for and when you are coming. November is the dry season. During November and December waist to head high waves, comparable to high season can still occur. You can definitely score until mid-January, but good swell transitions from being the norm to the exception as time moves on. This also means that from November on is a great time for beginner surfers. If you are looking to learn to surf or aren’t quite to the point where you are hunting for barrels yet, November through February are the time of year you want to come down. March through May are still good for beginners, though there will be times when our local break is too large and we will drive to a neighboring break to enjoy some more workable beginner waves. We recommend February for someone who is just starting out or needs to knock some rust off of their surfing hinges. Plenty of boat tour companies will be more than happy to take your money in February, but it is a lot of expensive driving around looking for big waves that probably aren’t going to come. Even if it is when we have our version of ‘cold’ water, it’s probably warmer than anything you get at home all year long. The silver lining is that the waves may be less than perfect but this is the best time of year to have days all to yourself. Personally, I will take fun little waves all to myself over perfect waves with crowds almost any day. Everyone is different and we want to make sure every guest has the best time that they possibly can. This is your vacation and we understand that you need to make the best of what little time you have off. A reminder that our Beginners promotion for February is booking up! Email reservations@giantsfoot.com or send a WhatsApp message to +505 8277 5111. Lock up a slot for only $900 and experience our all-inclusive Beginner Surfer Package for one week!